This log cabin is manufactured in 40mm interlocking wall logs in untreated white pine without a floor as standard although a floor can be purchased as an option. The Chamonix III Log Cabin comes with red beaver-tail roof shingles, a double part glazed (Perspex) door and a double window in the front elevation and a single window on the side. Window shutters are also included. 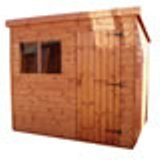 A Traditional Standard pent shed 6'x4' (1.83x1.22m) with many options available. A high eaves pent shed 12'x6' a superior design with many options available. A Three Tube small water feature. The petite size makes it ideal for smaller gardens. Stands 70cm (27") high. The Liverpool Log Cabin measuring 5x4m (16'4" x 13'1") is built using 44mm logs and is ideal for providing additional family living space, or as a large office. 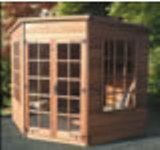 Devon Log Cabin measuring 3x4m (9'8 x 13'1) built using 44mm logs is ideal for providing additional family space.